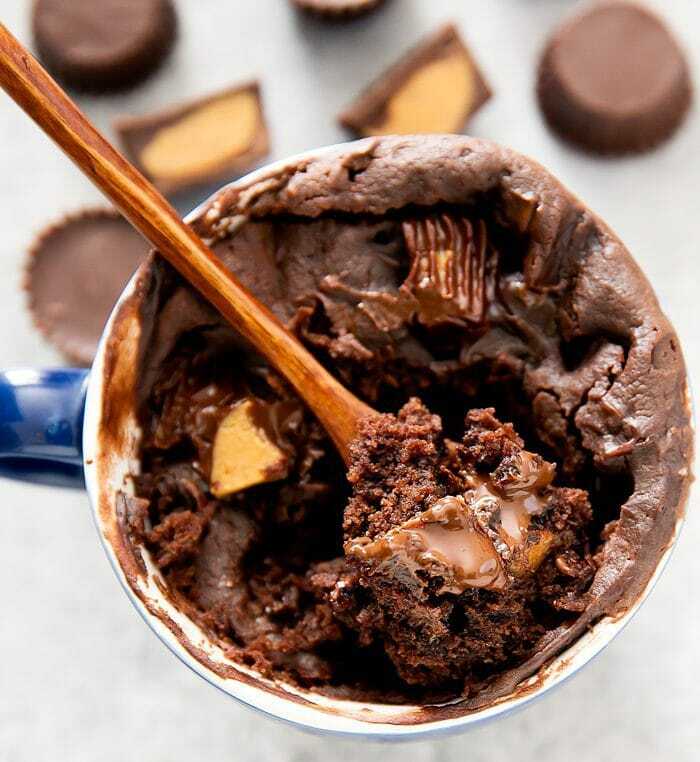 A single serving chocolate peanut butter cake mixed with chocolate peanut butter cups. This creamy mug cake cooks in the microwave in one minute. 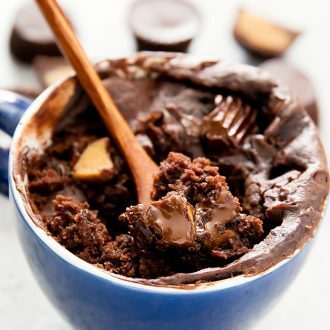 This mug cake combines so many of my loves: chocolate, chocolate peanut butter cup candy, and peanut butter. 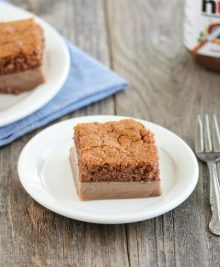 The peanut butter gives this cake a very rich, creamy and moist texture. 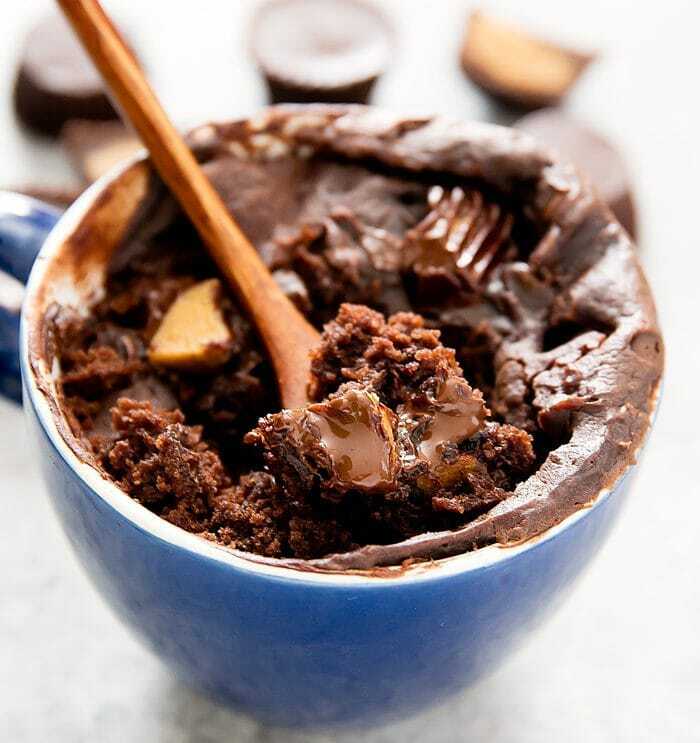 The chopped chocolate peanut butter cups melt slightly when cooked, so that there are pockets of melted chocolate throughout the cake. I had the idea to make this cake about a month ago after buying a mixed bag of dark chocolate candies, including dark chocolate peanut butter cups. I even set aside a few of them to make this cake, in case someone “accidentally” finished them all. And then I promptly forgot all about the cake and the peanut butter cups until I was rummaging through my snack closet the other day. I’m so glad I found these stowed away peanut butter cups because I love how this cake came out. It’s the perfect mid-week treat! 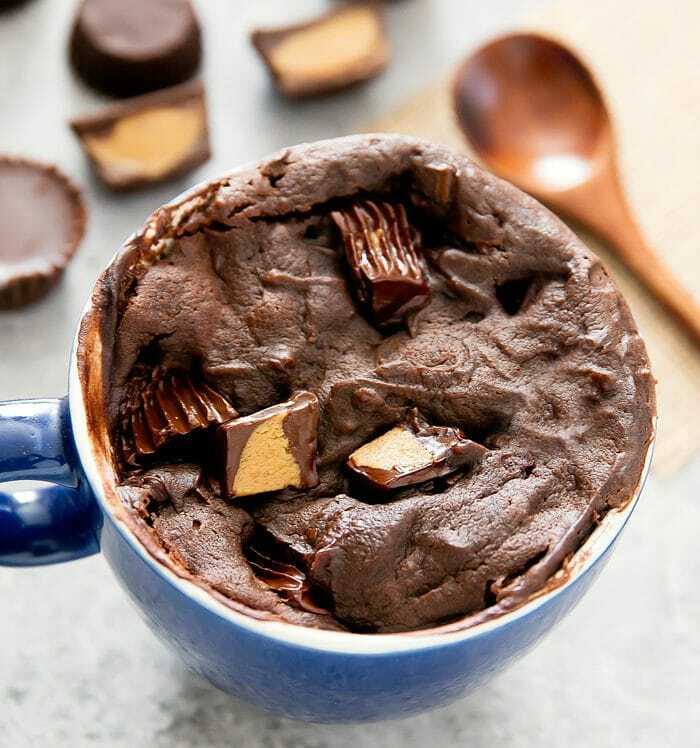 In a large microwave safe mug, add all ingredients except peanut butter cups. 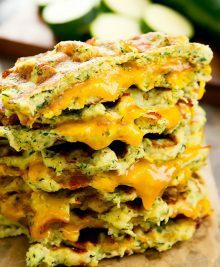 Using a small whisk, mix vigorously until batter is smooth and no flour chunks remain. The batter will be quite thick. Gently stir in 2 tbsp of chopped peanut butter cups into the cake batter. Sprinkle remaining 1 tbsp on top. Cook in the microwave at full power for about 1 minute. If cake batter is still gooey, cook for an additional 15 seconds. Allow cake to cool a few minutes before eating. Cake is best eaten warm. Next Post » Lofty Coffee Co.
Made this just now…didnt have the peanut butter cups, so used a wee bit chocolate chips. Used BetterBatter gluten free flour, and added one egg. Delicious. Thanks!